Clint Dempsey was happy about the USMNT results in a World Cup qualifier. Not so for rookie Jordan Morris, whose Olympic dreams vanished in a loss to Colombia. As the Seattle Sounders roster replenishes with the return of players from international duty, some are riding high from success, while others are nursing emotional or physical trauma. 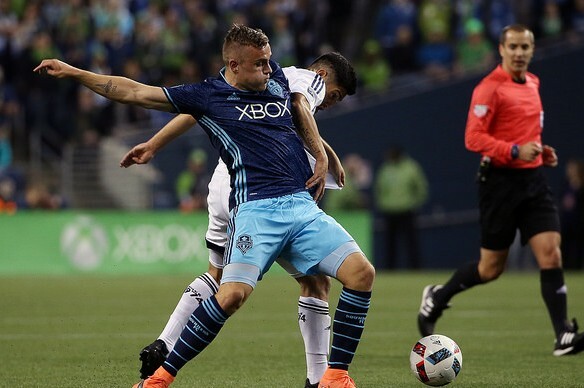 Clint Dempsey’s play for the USMNT senior team may prove a boon to the club, while the failure of the U23s to qualify for the Olympic tournament in Rio may further affect rookie Jordan Morris as he tries to adapt to the pro game. “(The Olympics) are a dream I’ve had since I was little,” said Morris Thursday. “It’s frustrating to have that opportunity be gone. Olympic soccer, restricted to players eligible for their nation’s U23 teams, has officially passed by Jordan Morris. He’ll be too old to be a part of the squad in 2020. More pressing concerns relate to the young forward adapting to MLS play, where he has struggled to finish his chances. While Morris was disappointed with missing out on the Olympics, coach Sigi Schmid said the removal of the tournament would let him focus on the MLS season. “Maybe pressure is off and he can really focus. But I don’t want to suffocate Jordan (with too many expectations),” said Schmid. Nelson Valdez echoed a similar sentiment, saying that the older forwards want to do more to alleviate the pressure on the youngster, who was signed to the richest Homegrown contract in January. If Morris is feeling uncomfortable under the scrutiny, then the return of Dempsey might provide a boost to both. After his goal in the 12th minute against Guatemala, Dempsey became USMNT’s all-time scoring leader in World Cup qualifiers. Tuesday’s match saw the national side respond to a disjointed 2-0 road loss March 25 into a 4-0 victory, retaking the initiative in the group stage of cup qualifiers for 2018. Dempsey said that the match did not wear him out, comparing the schedule to midweek matches the MLS plays later in the season and that he was “ready to go” for Saturday’s contest against Montreal (7 p.m., Q13 FOX). With the recent signing of veteran forward Herculez Gomez, Schmid may be looking for an alternative to Morris to let the 21-year-old recuperate psychologically—something Schmid hinted was sometimes necessary after international frustrations—before putting him back on the pitch. Schmid has Morris’s long-term future to think about, and will have to balance playing experience, and demonstrations of confidence, against the high expectations levied on Morris. Not to mention the fact that the Sounders sit at the bottom of the league table. Schmid and the Sounders maintain that they are not desperate for points. But they are certainly eager to start winning matches. Whether Dempsey’s international success carries over remains to be seen. Left back Tyrone Mears has his U.S. green card, granting him permanent resident status. The move frees up an international roster slot, which are restricted by MLS rule to an overall number that may be traded or purchased between clubs. Seattle has nine international roster slots; two are free with Mears’ removal. International players (and their nationalities) are: Oalex Anderson (St. Vincent & the Grenadines), Oniel Fisher (Jamaica), Erik Friberg (Sweden), Andreas Ivanschitz (Austria), Joevin Jones (Trinidad & Tobago), Román Torres (Panama), Nelson Valdez (Paraguay), and Damien Lowe (Jamaica; on loan with Minnesota United FC in the NASL). I wouldn’t start Morris Saturday, but I’d include him in the 18. He could use a break, mentally and physically. two days ago new Mc.Laren. F1 bought after earning 18,512$,,,this was my previous month’s paycheck ,and-a little over, 17k$ Last month .,3-5 h/r of work a days ..with extra open doors & weekly. paychecks.. it’s realy the easiest work I have ever Do.. I Joined This 7 months ago and now making over 87$, p/h.Learn. More right Hereo!240➤➤➤➤➤ http://GlobalSuperEmploymentVacanciesReportsJobs/GetPaid/98$hourly…. .❖:❦:❖:❦:❖:❦:❖:❦:❖:❦:❖:❦:❖:❦:❖:❦:❖:❦:❖:❦:❖:❦:❖:❦:❖:❦:❖:❦:❖:❦:❖:❦:❖:❦:❖:❦:❖:❦:❖:❦:::::o!240……..
“my .room mate Is getting 98$. HOURLY. on the internet.”…. two days ago new Mc.Laren. F1 bought after earning 18,512$,,,this was my previous month’s paycheck ,and-a little over, 17k$ Last month ..3-5 h/r of work a days ..with extra open doors & weekly. paychecks.. it’s realy the easiest work I have ever Do.. I Joined This 7 months ago and now making over 87$, p/h.Learn. More right Hereo!415➤➤➤➤➤ http://GlobalSuperEmploymentVacanciesReportsJobs/GetPaid/98$hourly…. .❖:❦:❖:❦:❖:❦:❖:❦:❖:❦:❖:❦:❖:❦:❖:❦:❖:❦:❖:❦:❖:❦:❖:❦:❖:❦:❖:❦:❖:❦:❖:❦:❖:❦:❖:❦:❖:❦:❖:❦:::::o!415…….